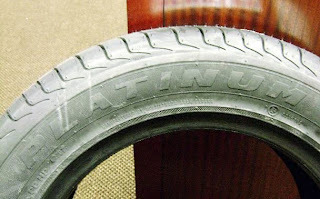 The TTABlog®: Test Your TTAB Judge-Ability: Why Are "ECSTA LX PLATINUM" and "PLATINUM" Not Confusingly Similar for Tires? Test Your TTAB Judge-Ability: Why Are "ECSTA LX PLATINUM" and "PLATINUM" Not Confusingly Similar for Tires? Applicant Kumho Tire sought to register the mark ECSTA LX PLATINUM for "tires; inner tubes for vehicle tires; mud flaps for vehicles; inner tubes." [At first, I thought it was a Latin proverb: "Law is platinum" - ed.] The Examining Attorney refused registration, deeming the mark likely to cause confusion with the registered mark PLATINUM for tires. The Board reversed. Why? In re Kumho Tire Co., Serial No. 77377089 (November 12, 2010) [not precedential]. Applicant contended that PLATINUM is a weak mark because the term is laudatory and therefore entitled to a limited scope of protection; that ECSTA is the dominant portion of its mark; and that the ECSTA LX portion is sufficient to distinguish the marks. It relied on website pages and third-party registrations for marks including the word PLATINUM in connection with tires, automotive products, and various other goods. The Examining Attorney acknowledged that PLATINUM is a weak mark but argued that Applicant merely added its house mark to the registered mark, thereby increasing the likelihood of confusion. The Board observed that even weak marks, like PLATINUM, are entitled to protection, but it agreed with Applicant that "the addition of ECSTA LX is sufficient to distinguish the marks for these identical goods." This is analogous to the case of Knight Textile Corp. v. Jones Investment Co., 75 USPQ2d 1313 (TTAB 2005) (NORTON MCNAUGHTON ESSENTIALS allowed to register despite opposition from owner of ESSENTIALS). There, in a situation similar to this one, the parties had in-part-identical goods and the applied-for-mark incorporated in full the registered mark. The Board found, however, that the registered mark (i.e., the shared term) was “highly suggestive as applied to the parties’” goods. Id. at 1315. Furthermore, the Board found that the addition of applicant’s house mark to what the evidence had shown to be a “highly suggestive” shared term resulted in a showing of no likelihood of confusion. Presented with similar circumstances here we reach the same result. Concluding that the marks are "more dissimilar than similar," the Board reversed the refusal. I have a semantic-oriented comment/query. But the opinion reads "highly suggestive" as a negative.